The title of this post says it all. 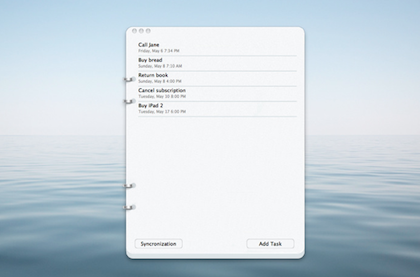 SmallTask, a very simple, nice looking, free app… now syncs with a free Mac Desktop version. SmallTask has been popular as that ‘other’ ToDo list manager that many of us use. Is has a paper like user interface where we can put our tasks. Those tasks can be date based too. 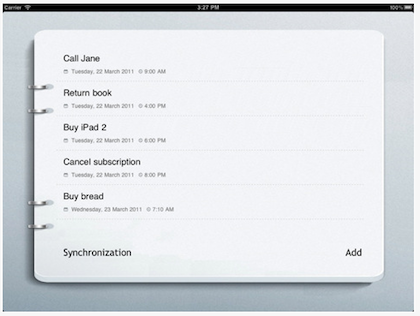 Then, the app syncs those tasks via the free cloud service DropBox to other iPads and iPhones. Making this a big hit for those quick lists we need to work with others on. SmallTask is not a high-end robust Task Manager for doing big projects (where you would use Omni Focus of Things). It does simple task lists, quickly, which are easy to share through DropBox cloud service. Now that there is a free SmallTask for the Mac too, we might be seeing the app open on more people’s desktops for their daily tasks. Many of the other apps that sync through the WiFi network keep getting blocked by the company security folks so the DropBox option is pretty reliable.